Имейте ввиду: выполняя упражнения и решая, какое время использовать — Present Perfect или Past Simple, Вы должны обращать внимания на все вышеуказанные обстоятельства, ибо одного из них может быть недостаточно для верного определения времени. Надеюсь, вам понятны различия между Past Simple и Present Perfect. Упражнение 1. Complete the pairs of sentences. Use the Present Perfect in one sentence and the Past Simple in the other. I (know) _______ her for six years. I (know) _______ him when I was at school. He (live) _______ in Paris from 1997 to 2000. He (live) _______ in New York since 2001. Where's Pete? I (not see) _______ him for ages. I (not see) _______ Pete last night. We (be) _______ at primary school from 1993 to 1998. We (be) _______ in this class since September. I (not watch) _______ this video yet. I (not watch) _______ a video at the weekend. 1. I ________ (never/ be) to the USA. I ______ (want) to go there last summer but I couldn’t. 2. He _______ (live) in this street all his life. 3. His father ________ (come back) to London last Sunday. 4. Yan __________ (write) a letter to Nick two days ago. 5. He ________ (send) his letter yesterday. 6. They ________ (just/ buy) some postcards. Упражнение 3. Fill in last night, ever, ago, just, yet, always in the right place. 1. Nick’s uncle went to Russia 3 years. 2. Mr. Rambler has come back from Belarus. 3. Nick has wanted to visit Belarus. 4. Mr. Rambler saw Yan. 5. They haven’t visited this old castle. 6. Have you been to England? Упражнение 4. Choose the correct option. She has /‘s had a moped since she was 15. We took /‘ve taken a taxi to town that morning. I'm really hungry. I didn’t eat / haven’t eaten since last night. They visited/ ‘ve visited Colorado last summer. Упражнение 5. Put the verbs in brackets in the Past Simple or in the Present Perfect. 1. Maria (get) ______ some bad news last week. She (be) ______ sad since she (get) ______ the bad news. 2. I (start) ______ school when I was five years old. I (be) ______ at school since I (be) ______ five years old. 3. I (change) ______ my job three times this year. 4. I (change) ______ my job three times last year. 5. The weather was hot and dry for many weeks. But two days ago it (rain) ______. 6. Tom (break) ______ his leg five days ago. He’s in hospital. He (be) ______ in hospital since he (break) ______ his leg. 7. Are you going to finish your work before you go to bed? — I (finish) ______ it (already). I (finish) ______ my work two hours ago. Упражнение 6. Put the verbs in brackets in the Past Simple or in the Present Perfect. 1. I (have, just) ______ a nice pot of coffee. Would you like a cup? 2. I (see, not) ______ Steve this morning yet. 3. Carol and I are old friends. I (know) ______ her since I (be) ______ a freshman in high school. 4. Maria (have) ______ a lot of problems since she (come) ______ to this country. 5. I (go) ______ to Paris in 2003 and 2006. 6. A car came round the corner and I (jump) ______ out of the way. 7. Don’t throw the paper away because I (not to read) ______ it yet. 8. Is Jim going to eat lunch with us today? — No. He (eat) ______ (already).He (eat) ______ lunch an hour ago. 9. Since we (start) ______ doing this exercise, we (complete) ______ some sentences. 10. I (be) ______ never to Italy. Упражнение 7. Put the verbs in brackets in the Past Simple or in the Present Perfect. 1. You (ever work) ______ in a shop? 2. I (work) ______ at my uncle’s shop when I was younger. Упражнение 10. Complete the sentences. 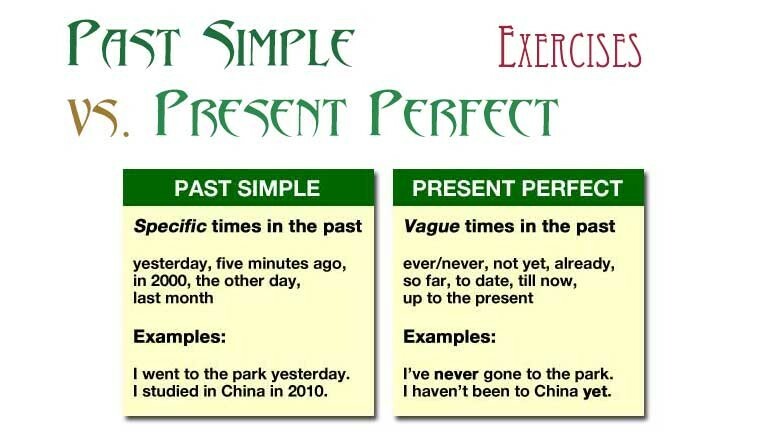 Use the Present Perfect or the Past Simple. My family and I (move) from London to Cardiff last summer, so we (live) in Cardiff for seven months now. I miss my friends in London. My best friend is called Megan. We (meet) at primary school, so I (know) her for nine years. Unfortunately, I (not see) her since last summer. I go to Greystone Secondary School in Cardiff. I (be) at the school since last September. At first I (not like) it because I (not have) any friends here. But the students in my class are really nice and I'm happy here now. Упражнение 11. Correct the mistakes in these sentences. We lived here since 1997. I've been ill since two days. Susie has seen a good film last night. We've finished our homework just. I've already wrote three letters. Упражнение 12. Complete the sentences. Use the Present Perfect or the Past Simple. Helen: That's a nice tennis racket. Is it new? Andy: No, (I/have) ________ it for about a year, but ( I/not play) _______ with it very much. ( I/buy) ________ it in Florida. Helen: When ( you/go) ________ to America? Andy: ( I/go) ________ there with my family in the spring. Helen: What was it like? Andy: Great! (I/stay) ___________ with my penfriend. Helen: Is your penfriend American? Andy: Yes. ( I/have) ________ an American penfriend for two years. (he/come) __________ to England last summer. Helen: (I/not meet) _______ him. Andу: No, (you/be) ______ on holiday in Turkey. Упражнение 13. Choose the correct form of the verb. We went/ ‘ve been to the seaside last summer. I finished / ‘ve finished my homework. Can I go out now? I was /‘ve been ill three months ago. Have you been / Did you to the shop? I need some stamps. My hobby is fishing. I’ve caught / caught a lot of fish. Jenny is in Oxford today, but she was /has been in London yesterday. I played /'ve played basketball when I was younger, but l don’t play now. I’ve already seen / already saw 'Shrek'. Julie has been / was ill since Tuesday. I didn't see / haven't seen Josh since 1998. We've stayed / stayed at our grandparents for three days. We arrived home yesterday. The dog went / has gone to sleep an hour ago. I had / ‘ve had a cat for two years. Its name is Willis. I’ve waited / waited for a bus for twenty minutes. Then I decided to walk. 1. Nick’s uncle went to Russia 3 years ago. 2. Mr. Rambler has just come back from Belarus. 3. Nick has always wanted to visit Belarus. 4. Mr. Rambler saw Yan last night. 5. They haven’t visited this old castle yet. 6. Have you ever been to England. Moved, have lived, met, have known, haven’t seen, have been, didn’t like, didn’t have. Возможны и другие варианты ответов. 48 Комментариев для "Past Simple и Present Perfect: упражнения с ответами"
8 упражнение, 8 вопрос — в ответе похоже слеш стоит не в том месте. Спасибо! Упражнения лучше. чем у Мёрфи, отлично! Ого, вот это комплимент!!!! Спасибо, Ольга! Очень увлекательно! Спасибо! В 9 упражнении 4 предложении already так и останется в конце предложения или нужно поставить после has? Спасибо! Можно поставить после has, можно оставить. Как раз у меня открыта одна из грамматик, где по этому поводу написано, что already может стоять в конце предложения, если есть элемент удивления у говорящего. Но, конечно, лучше поставить после has. В четвертом упражнении 2-ое ,кажется, неправильный ответ.Думаю, правильнее «We HAVE TAKEN a taxi to town that morning».Потому что, сегодня еще не кончилось ,если стоит « that morning».Тут Simple не уместен. В 4-ом упражнении,в первом пункте is had неправильно,там должно быть просто has. В 9-ом упражнении,в 8-ом пункте was не правильно,там должно быть have been т.к. в предложении используется прошлое неопределенное время. Там же стоит указание на прошлое, на моей первой работе. Может у него была и вторая и третья. Past Simple правильно. В 13-ом упражнении,в 11-ом пункте was не правильно,там должно быть have been т.к. в предложении используется прошлое неопределенное время,а также ключевое слово-for three days. Следующее предложение объясняет употребление Past Simple в первом. Они уже приехали домой. Не могли бы объяснить упражнение 7 пункты 3,4,9 объяснить правильный ответ, до этого 6 сделал без ошибок. 3. It is the first time I (be) ______ on a ship. Ответ have been. В подобных предложениях (Это впервые...) употребляется Present Perfect, так как говорящему не важно когда, а важен сам факт того, что действие имело место. 4. Ann is looking for her key. She can’t find it. She (lose) ______ her key. Ответ has lost — здесь есть результат — Анна потеряла ключ, и потому она его ищет. 9. He (have, not) ______ any problems since he (come ) ______ here. (hasn't had / came) У него не было проблем с момента в прошлом. Момент в прошлом выражен Past Simple — came (с тех пор, как он приехал). Это очень частый паттерн предложений Present Perfect (Continuous) since Past Simple. Здравствуйте, объясните пожалуйста, почему в пятом упражнении в примерах 2 и 6 (в обоих случая я имею в виду второе предложение)нужно употреблять сперва Present perfect, затем Past simple. А в шестом упражнении в аналогичном случае (пример 9) наоборот?. Спасибо. Добрый день, Андрей. случаи совершенно не аналогичные, точнее аналогичные, но действия описаны наоборот. I (be) ______ at school since I (be) ______ five years old. — я учусь в школе с шести лет. Здравствуйте, объясните пожалуйста, почему в 7 упражнении в 5 предложении используется Past Simple? Добрый день, Сергей. Так как речь идет о человеке, который жил очень давно, то мы употребляем Past Simple. Если бы речь шла о ныне живущем композиторе — использовали бы Present Perfect. Объясните, пожалуйста, почему в 10 упражнение в двух последних предложениях используется Past Smple (didn’t like, didn’t have). Спасибо заранее! Валерия, действие происходило last September (в прошлом сентябре). Елена, после how long — не указание на время, а лишь на протяженность действия. На время указывает when (когда). В вопросах с when (в данном контексте) мы будем употреблять past simple. Почему в 5 упражнении в 1,2,4 заданиях в последнем пропуске мы глагол пишем Present Simple, а не а Present Perfect? Ведь там же есть слово since? Роман, не в Present Simple a в Past Simple. . Maria (get) ______ some bad news last week. She (be) ______ sad since she (get) ______ the bad news. She has been sad since she got news (получила новости в прошлом, из первого предложения даже знаем, что на прошлой неделе). Since относится к выражению have been sad. В упражнении 13 пара ошибок. Добрый день! Объясните ,пожалуйста, почему в 13 задании 14 предложение waited ? Слово For указывает, что это Present Perfect! Хотя если не рассматривать это предложение в рамках Past Simple и Present Perfect, вернее будет употребить Past Perfect Continious,так как тут подчёркиваеться длительность времени -"for twenty minutes"
Жанна, абсолютно верно вы рассуждаете насчет Past Perfect Continious (но такого варианта нет). Добрый день. Подскажите пожалуйста,почему в 1 упр. 2 предложении используется past simple? Я всегда думала,что если указан промежуток в прошлом,то подчеркивается длительность и нужно употреблять Past Continuous. Здравствуйте. Объясните, пожалуйста, как решается у 7-го задания 8-й пункт?